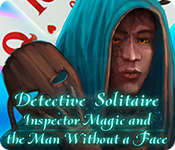 Detective Solitaire: Inspector Magic And The Man Without A Face is rated 3.0 out of 5 by 7. Rated 5 out of 5 by jeannemchilde from What a challenge! This game requires total focus which I love. I feel really victorious when I accomplish each level. Rated 4 out of 5 by deddu from FIND ALL THE GOLD CARDS I really like this version of up/down solitaire as it is more challenging than just eliminating all the cards. As before you start as the "Newbie" and then progress. You can redo until you get to the Professional and there you have to wait until you complete the entire level to redo. Rated 4 out of 5 by RudyJM from Good Solitaire Game I liked this game. It has a decent story line and the music isn't as distracting as most games. Rated 3 out of 5 by biscuitsmama from PERFECT FOR A QUICK GAME OF SOLITAIRE Detective Solitaire: Inspector Magic And The Man Without A Face is another of the one up/one down solitaire games that we always see here at BFG. Since I enjoy playing a quick game of solitaire when it is time to take a break, this game fits the bill. The graphics are quite nice and we do have an option to change some of the themes. Although I do know how to play this type of game, I can appreciate a bit of information on the various options that are included in the tutorial. That being said, there doesn’t appear to be a way to turn the tutorial off at the beginning of the game. As you play the game you will earn coins that will allow you to purchase some power-ups such as a Joker, Undo your last move, and a Shuffle. You earn coins by placing cards on the pile and the more cards you place the more coins you earn. You also earn a much larger amount of coins by using the designated gold cards. Once you have placed all of the gold cards, you win the game and earn a perfect score. I’m not going to go into all the details but will only say that I did enjoy the game but as always, please try the demo to see if it is one you will enjoy as well. Happy gaming! Rated 3 out of 5 by maudia from Another Solitaire Game This is a very smooth running game. I played the first 10 Newbie levels. It's a very relaxing solitaire game but it's just not challenging enough for me. You earn coins to buy bonus items. Nothing new here. 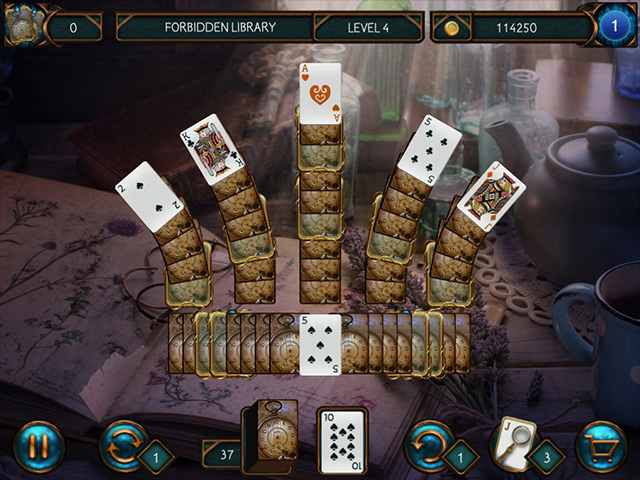 I wish developers would make these solitaire games with different solitaire type games not just the one up one down. Rated 1 out of 5 by CyndiLouWho2 from Catchy title but it's the same old thing This is a one up one down type of solitaire game which I enjoy. Usually. However, what we have here is yet another re-hashing of this developer's solitaire games. Simplistic graphics, nothing new in power-ups or upgrades. And there really is no story so don't let the title fool you. There's absolutely nothing to hold your interest because it's just one boring level after another. You are awarded very little for solving each level but buying an Undo, a Joker or a Shuffle will cost you a small fortune. There are no little mini games or puzzles between levels or chapters and there's nothing fun to buy, decorate or build. So, if you have played any of the previous solitaire games from this developer, you can pass on this one. Rated 1 out of 5 by pennmom36 from THANKFULLY THE MINISTRY OF MAGIC ONLY NEEDS MY HELP ONE LAST TIME! No Surprise, this third and final Detective Solitaire is exactly the same as the last two. Once again the scenes are the same as they were in the first two games and the solitaire layouts are the same even though some of them have been switched as the order they appear. There are once again 9 Card Graphic Themes to choose from and 3 Font sizes or styles, but even the design is the same. The music isn't bad, but yes, it too is the same, not to mention that at times the music pauses and you're left with awkward silence. As usual, the game begins with a tutorial in Newbie Mode which allows you to replay any level. After completing the tutorial or opting out by clicking on the tutorial X, you can choose the Professional Mode which only allows you to play the entire 10 level pack. This is a Higher/Lower style Solitaire game where the only goal is to remove all of the Gold Cards. Once the gold cards have been collected, you will earn the maximum amount of points and the game ends even if other regular cards remain. If you remove all gold cards you'll get a perfect score and the points of that level are added to the next level similar to bowling scores. You must earn the required amount of points to unlock the next location and there are 20 Locations with levels per location. 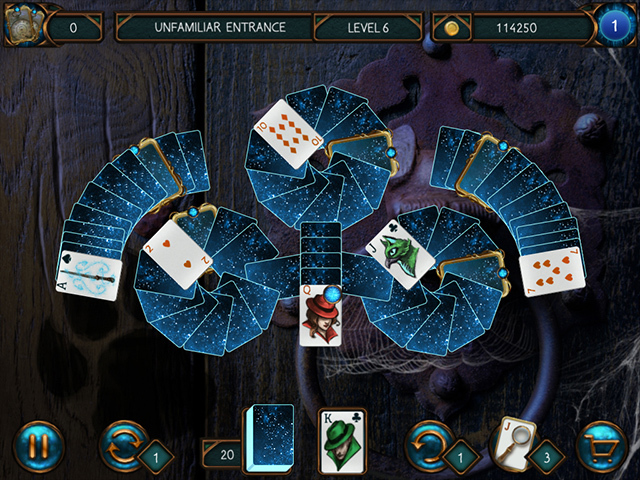 When you remove cards with a round blue gem, you will receive either +499 points, a Joker, a Shuffle or Mulligan (undo) and you can buy Jokers, Shuffles, and Mulligans within the Shop with the points you have earned, at a ridiculous price point. Once again, this game states that there are Achievements to earn, but I've yet to earn one, but then again, I didn't play further than the demo because I have no desire to waste money on a game that has nothing new to offer, and never gives me the option to continue playing after removing all Gold Cards. I refuse to even use a PCC. When and if they decide to change something other than the title, I may consider it, but only if they make an option that allows me to remove all of the cards, not just the Gold Cards. DETECTIVE SOLITAIRE SERIES LIST Title***Release Date***Average Rating 1-Inspector Magic (August 12-2018) 2.8 2-And The Forbidden Magic (September 2-2018) 1.8 3-And The Man Without A Face (September 23-2018) n/a by: 8 Floor LTD.